Investors Management Corporation annual letter for the year ended December 31, 2017. Long-time readers are likely familiar with Connor Leonard, but for those who don’t know him, Connor is a good friend of mine who runs the public securities portfolio at Investors Management Corporation. Investors Management Corporation is a holding company located in Raleigh, North Carolina. The firm focuses on long-term ownership of outstanding companies in both the public and private markets. Today, I wanted to share Connor’s letter that he wrote to IMC shareholders. While IMC is a privately-held company, they have allowed Connor to shared a condensed version of his 2017 Annual Letter with my readers. Enjoy! The Investors Management Corporation Public Portfolio performed well in 2017 while maintaining a conservative exposure that averaged 71% net long throughout the year. The strong underlying return on capital deployed into long investments was reduced by negative returns from market hedges and a cash balance that ranged from 21% to 43% throughout the year. The market hedges remain in place going into 2018, with the portfolio currently 73% net long. IMC is a privately-held company with internal capital, providing both the capacity and desire to invest in the public markets as a long-term business owner. This is exceptionally rare and enables everything we do as investors. We start with this advantage and work backwards. 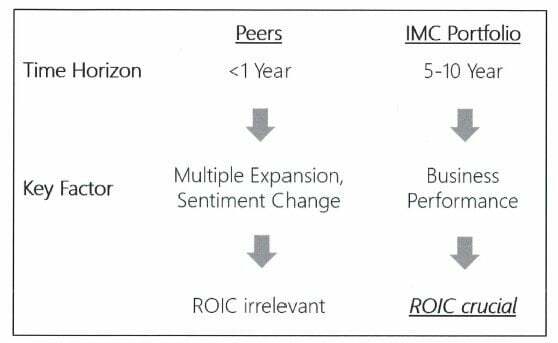 We invest on a longer-term horizon because the playing field five plus years out in the public markets is far, far less competitive - giving IMC a much greater chance of success. Rather than trying to be better than all our peers in a crowded game, we would rather play a different game with a higher probability of success. While this strategy is simple to explain, the key is that it is difficult for others to emulate. Many investors claim to operate with a long-term view, but structural factors conspire against them, often creating an environment where looking out further than one year is impractical to impossible. The running joke is every investor is long-term oriented - as long as there is a catalyst in the next three to six months. This means the market for great ideas that will perform within one year is extremely competitive, with a concentration of immense talent and skills focused on this time frame. The factors driving a stock’s performance in the short-term are mostly external and relate principally to sentiment change on the security. It doesn’t matter what the economics or long-term trajectory of a company are, but rather how it delivers against analyst estimates and the subsequent multiple change that follows. Not only is this short-term information the most sought after in the market, but with limited shelf-life the insights and securities must be recycled constantly. If the investment time horizon is stretched out to years instead of months, the key variables begin to change. Multiples and sentiment are certainly a factor, but returns on a five to ten-year time horizon are primarily correlated with the performance of the underlying businesses. As a result, we prioritize factors internal to a business, principally focusing on a company’s ability to reinvest capital internally at high rates for many years. These factors are often overlooked by the market, and insights tend to be durable, meaning a handful of them can prove to be profitable for years. We believe the “long game” is the best advantage in the public markets currently, and this edge should sustain or widen over time as the market’s focus continues to shorten. This approach aligns with IMC’s structure, as well as my skill set and personality, and gives us the best chance of compounding capital at high rates going forward. The IMC Public Portfolio has no restrictions on geography, sector, security type or portfolio construction. My mandate is to invest exactly as if it’s my own money, which can be three stocks, three hundred stocks, or no stocks. Operating with the mentality of a private industrialist investing their own capital is a luxury compared to peers who are constrained by various silos, benchmarks, and parameters. This flexibility, if paired with a commitment to the process of constant improvement, should result in an informed allocation of capital to the best possible opportunities - regardless of whether the investment fits neatly into a style box. As an example, while attending the Daily Journal meeting in February, I became interested in China given how profusely Charlie Munger was encouraging investors to spend time studying the country. Many investors nodded along to this sentiment, but did not explore it further, because they work at a fund where China or international is outside their mandate. I decided to dive in head first, going through a “China month” where I read a Chinese annual report each morning, books about China each afternoon, and spoke with several investment and operating professionals from China along the way. I emerged six weeks later fascinated with the country, and excited about one company in particular which became a new holding later in the year. For any questions on the letter or any questions/comments regarding Connor’s work, please reach out to him at cleonard@investorsmanagement.com, or on Twitter at @Connor_Leonard.